Don't think about how it is. Think about how it should be. Now apply this philosophy to business checking. If we did, would we continue to offer Analysis Checking or some variation of it? Yet we do. Even though the Dodd-Frank Act eliminated Reg Q, that pesky reg that did not allow banks to pay interest on business demand deposits. Because of Reg Q, in place for over 80 years, banks created Business Analysis Checking, where a business earns credits to offset fees based on their balances. 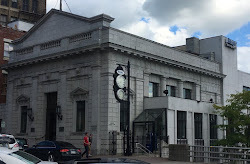 See a Union Bank of Richmond, VA description of a typical Business Analysis Checking account. But it doesn't stop at the checking account. Businesses want to earn interest on their excess funds. So they determine how much to leave in their non-interest bearing, analysis checking, and then sweep the excess to some interest bearing vehicle, such as a money market account, or, gasp, a repo because prior to the financial crisis deposit insurance only extended to the first $100,000 of a business's deposits. Repo's are generally collateralized. So there is all sorts of complications going on to run a checking account and to pay business interest on guaranteed funds. I say no. 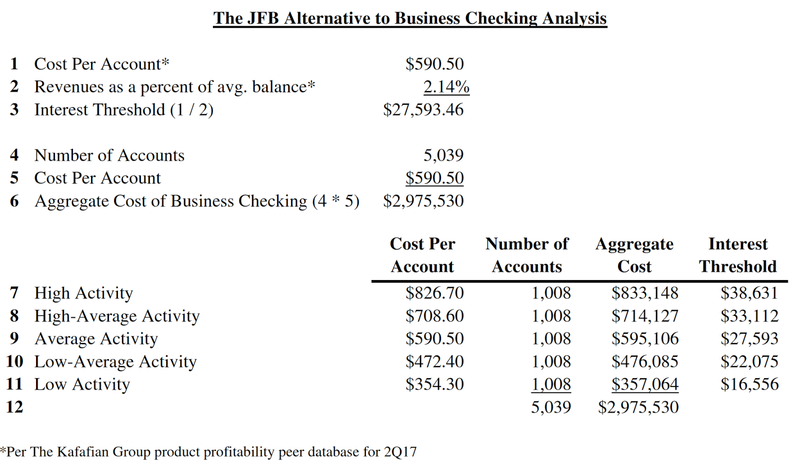 And because highlighting a problem without proposing a solution is whining, I propose the JFB Alternative to Business Checking Analysis. Or the JFB Business Banking Cash Maximizer. My firm measures product profitability on an outsourced basis for dozens of community financial institutions. As a result of this line of business, we are able to see product spreads, fees, and costs. And by costs, we measure the average organizational resources to originate and maintain a business checking account. The average for all of the banks in our profitability universe was $590.50 in operating expense per year. We also calculate the spread using coterminous funds transfer pricing (FTP), and the actual fees assessed to those accounts. That combination of spread and fees was 2.14% of balances during the second quarter 2017. Knowing the operating cost per account, and revenue generated as a percent of balances, you can calculate the average balance needed to be maintained to cover the account's costs. Said another way, it's breakeven balance. See the table. 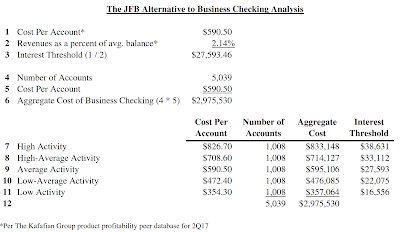 Based on the average operating cost per account, and revenue as a percent of balances, the average account holder would need to maintain an average balance of $27,593.46 to cover the bank's costs. Hold on though. Nobody is average, right? Our universe of business checking customers vary on their account utilization. Some are high cash businesses, that frequently make a night drop of deposits requiring our tellers to validate and make the deposits. Others are no cash, and use our RDC machines to deposit a relatively small amount of checks. You see that I divided account types into quintiles to make this distinction. What this requires is a way that your core system can put a code to determine which quintile each account belongs. I believe this can be accomplished by the oft-cited with few practical installations... Artificial Intelligence, or AI. Your core tracks transaction types per account. Each transaction type uses a certain amount of bank resources. You don't have to come up with a dollar amount, highly contrived by the way, of each transaction. Such as an ACH costs the bank $18.65. But what you can do is say that in terms of resource utilization, an ACH takes 2x the resources used by an RDC deposit. So, for example, an ACH might have an 8 on a scale of 1-10 for resource utilization, and an RDC might be a 4. By scoring transactions by resources used, you can then divide your business checking customers into the above quintiles, and assign a cost per account accordingly. The aggregate dollars it takes your bank to originate and maintain business checking accounts remains the same, at $2.975 million. But the cost per account is broken up by resource utilization. So the one-person law firm that RDC deposits 20 checks per month might be designated a Low Activity quintile, and be assessed a $354.30 operating cost. While the cash-driven marijuana shop that drops off loads of cash over the teller line each day, would be rightly assessed $826.70. Now you have the means to determine the minimum average balance to cover costs. Anything over that amount, is paid interest. No sweep. No analysis, at least not in the past use of the word. No multiple statements. And no human intervention. Just an easy account to explain to your client. And an easy one for your client to manage. Let's send Business Checking Analysis to the Betamax pile of history. Are any of my readers doing this? Bankers: Ask What Customers Want. Then Do That.